It’s no longer a question of whether or when a company will experience a DDoS attack; the real question is how often. The reality is now, quite simply, that “breach is a foregone conclusion.” DDoS attacks are becoming more common against the same companies worldwide as perpetrators intensify their online aggressions. 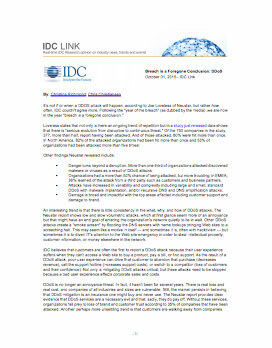 In this report, IDC interviews Neustar and discusses the findings of our comprehensive 2015 US and EMEA DDoS report, The Continuous Risk to Digital Brands, and the quickly evolving role of security in online threats. DDoS attacks are now frequently smaller, more annoying attacks to divert the IT team’s attention while they carry nefarious schemes. A breach is no longer an anomalous occurrence; it is continuous and of central concern to the C-Suite and Board. The idea of security being an expensive insurance plan in case something happens is a concept of the past. Read about IDC’s interview with Neustar on how DDoS attacks have evolved from being occasional and isolated threats to frequent and continuous events.